2. Which of the following statements must be true? i) Country A spends minimum amount of its budget on arms. 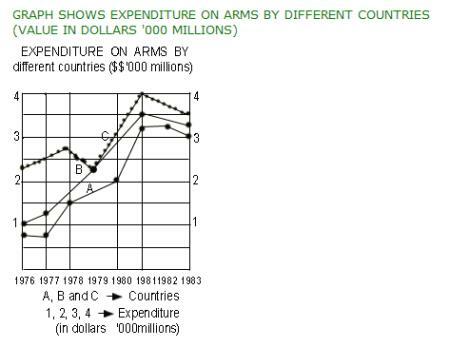 ii) Throughout, Country C has spent the maximum amount on arms during the years shown. iii) An examination of the information for the last 3 years reveals that generally all 3 countries are reducing their expenditure on arms. None of the statements above. 3. If Fiat’s Palio is launched at its scheduled time, by when should they be able to break even? 4. What part of the cost of project is not obtained for Mitsubishi after 15 months of sales of the Lancer? 5. Kinetic small car will be able to cover what percent of the cost of project after a complete year? 6. Immediately after breaking even, Honda install ASB kits on its City model. This requires an additional Rs. 40 crore towards the project cost. At the same time the selling price of the car is increased by Rs. 50000. At the end of an entire year from then, what is the point that Honda’s city makes? 7. A year after the launch of Lancer, Mitsubishi decides to launch a new model using the same assembly line. The line is capable of providing twice the production capacity as that of the Lancer, while the new car will be sold at half the price of the Lancer. 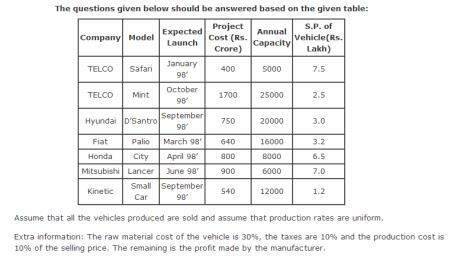 What will be the ratio of annual profits of the Lancer to those of the new model, if the initial cost incurred for the new model is ignored?